The response from the public, local businesses and SAR partners has been overwhelmingly positive, with both the Southbourne Mobile Coastguard unit and members of the Mudeford Lifeboat Crew visiting the Lookout to voice their support and appreciation. Since moving into the Lookout a month ago, four of the trainee watchkeepers have qualiﬁed, bringing the total number of qualified watchkeepers to twenty-two (fourteen of whom are ‘home grown’) and there are currently a further thirty-eight watchkeepers in training as well as sixteen observers who will be attending the next watchkeeper course planned for early November. This continued growth in qualiﬁed watchkeepers has enabled the Station to now operate from Wednesday to Sunday inclusive, with Thursdays being a dedicated training day. On-site collection boxes are receiving donations from passers-by every week and the station is looking forward to holding its ﬁrst Grand Charity Auction on 13th October to swell the coﬀers further. 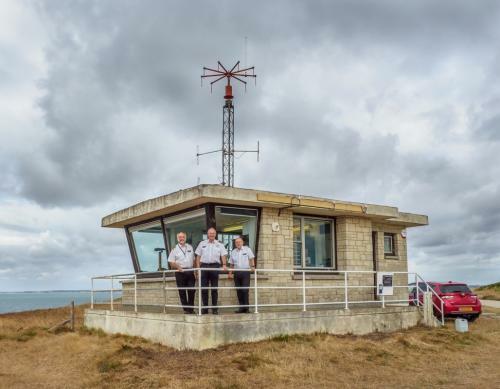 Special thanks go to Bournemouth Council for supporting NCI Hengistbury Head’s use of the Lookout, and also to MCA Estates for doing what was necessary to allow use the Lookout, which is also a Remote MCA VHF Site.